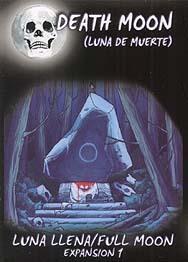 Death Moon is an expansion for the Full Moon Boardgame, it is necessary to have a copy of Full Moon to play Death Moon. With this expansion the lycanthrope player gets 6 new pack cards that provide the werewolves with a greater variety of resources. The expansion also adds 3 new hexagon tiles to Aguirre's Forest and 1 new special item that makes Full Moon a nastier experience... on the other hand, the human and werewovles characters, acquire special secrets skills that can be used once per game.